Former Virginia State Bar President David Bobzien succumbed to leukemia on December 30, 2019, with his wife, Cathy, at his bedside. Bobzien, who was 72, served as the 2004-2005 bar president, the first local government attorney to hold the position. A graduate of Holy Cross and the University of Virginia Law School, Bobzien also held an LLM in Taxation from George Washington Law School. His career spanned the JAG office at Fort Meade, private practice with Fitzgerald & Smith in Fairfax, and the Department of Justice, before becoming County Attorney for Fairfax, where he served for 23 years until his retirement in 2016. 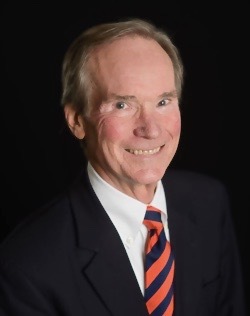 Bobzien was an active volunteer of his time and experience with the bar, serving in many roles including as ABA delegate, on Council, on the Executive Committee, as president of the Virginia Law Foundation, and as president of Lawyers Helping Lawyers. Bobzien also chaired the Local Government Law Section, the Better Annual Meeting Committee, and the Nominating Committee. In his personal life, Bobzien was active in his church, with the Boy Scouts, and a member of the Ancient Order of the Hibernians. An avid runner and fitness enthusiast, he was a member of the Reston Runners and the YMCA. He enjoyed world travel, but particularly loved the Shenandoah Valley and Lake Tahoe, and spending time with his children and grandchildren.